Law professor Aaron Saiger, left, with U.S. Supreme Court Associate Justice Ruth Bader Ginsburg at Fordham. U.S. Supreme Court Associate Justice Ruth Bader Ginsburg enthralled a capacity audience of more than 300 at Fordham Law School on Tuesday night with life- and career-spanning insights on her various roles as incisive legal scholar, accomplished Supreme Court litigator, distinguished judge for the United States Court of Appeals for the District of Columbia, and, of course, the second woman justice of the country’s highest court. 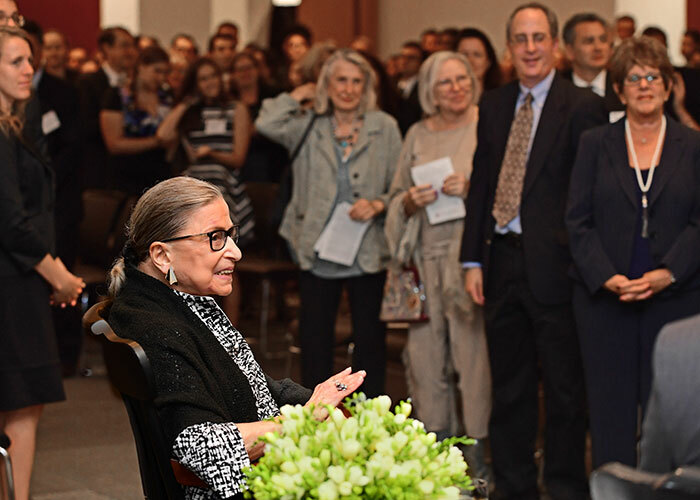 As part of the Robert L. Levine Distinguished Lecture Series sponsored by the Fordham Law Review, Justice Ginsburg spent 90 minutes dispensing legal wisdom, practical advice, and not a little of her trademark sense of humor. 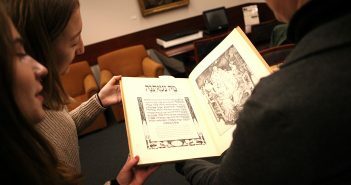 Fordham Law School Professor Aaron Saiger, a nationally recognized education law scholar who clerked for Justice Ginsburg during the 2001-2002 term, served as moderator, posing questions from faculty and students. As a young woman growing up in Brooklyn in the 1930s and 40s, Justice Ginsburg did not aspire to become a Supreme Court Justice; women were, after all, generally dissuaded at the time from becoming lawyers, and it would be a half century until the first woman would be appointed to the Court. In the 1970s, numerous legal provisions treated men and women differently. Justice Ginsburg, then the director of the ACLU’s Women’s Right Project, argued successfully for gender equality in a number of Supreme Court cases, including Reed v. Reed, Frontiero v. Richardson, and Weinberger v. Wiesenfeld. Today, nearly all gender-based distinctions, with the exception of some in the area of immigration law, have been excised from state and federal law, Justice Ginsburg noted. Women are also better represented in the branches of government, with a major party presidential candidate, 20 U.S. senators, and the three current Supreme Court justices, she noted. 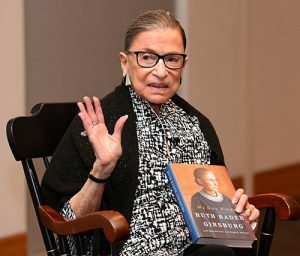 “We have come a very long way, but there are still hurdles,” Justice Ginsburg said, adding unconscious bias, as opposed to outright discrimination, and work-life balance are the biggest issues women face today. Justice Ginsburg credited former President Jimmy Carter, who appointed her to the United States Court of Appeals for the District of Columbia, with changing the gender dynamic of American courts in his lone four-year term. Carter appointed 25 women as district court judges and 11 as appeals court judges. Not wanting to be outdone, Carter’s successor President Ronald Reagan nominated Sandra Day O’Connor as the first woman to the Supreme Court. After Justice Ginsburg began serving on the Court in 1993, a handful of attorneys seemed not to be able to conceive of a Supreme Court bench with two female justices; Ginsburg told the Fordham audience that, near the beginning of her Supreme Court tenure, some individuals arguing before the Court mistakenly addressed her as Justice O’Connor. After Justice O’Connor’s retirement in 2006, the back-to-one gender imbalance felt particularly stark to Justice Ginsburg, particularly when younger visitors stopped by the Supreme Court. Today, the gender ratio has improved, and Justice Ginsburg is not easily confused with her two fellow female colleagues. “No one calls me Justice Sotomayor or Justice Kagan,” the soft-spoken Justice Ginsburg joked, eliciting audience laughter. In addition to her female peers, Justice Ginsburg spoke at length about the late Justice Antonin Scalia and former Chief Justice William Rehnquist, in response to Saiger’s questions. Justice Scalia’s sudden death in 2016 left the Court with only eight members. In the aftermath of the noted conservative jurist’s death, some Supreme Court–media neophytes were surprised to learn that he and the liberal Justice Ginsburg were close friends, who shared a love of opera among other interests. While many of Saiger’s questions focused on weighty issues related to the Supreme Court and Justice Ginsburg’s role in enhancing gender equality, some of Justice Ginsburg’s comments took a lighter tone. 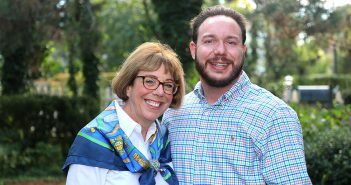 For instance, she spoke about the origins of her famous nickname, which derived from a Maryland law student’s Tumblr and later became the title of a best-selling book. 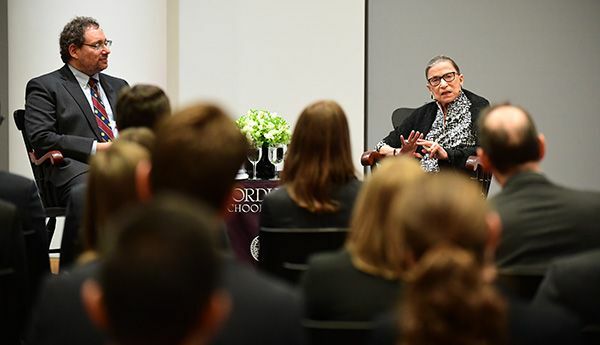 Toward the end of her talk, Justice Ginsburg challenged students in attendance to use their legal talents to repair tears in their communities, noting she received the most satisfaction from work in which she received no compensation. Access to justice is a serious problem in America, she said. She referenced the fine print in cell phone and credit card agreements that bar class-action lawsuits as one notable example. She also declared Citizens United, with its significant financial impact on elections, the most regrettable Supreme Court decision in recent memory.